Do you know if the IP address of users is tracked? That way, you might be able to limit a baddie from creating new accounts by blocking that IP. That is very hard to accomplish as it is very easy to get new IP's using proxy servers. I was just matched up w/ " 12" again, but this time I was ready. I scouted his General on the first move and he slammed his Marshal into a bomb behind the lake. ;-) At that point, he stopped playing, but told me I would have to "wait" for my win; he then ranted away in the chat until the buffer ran down. This guy is a freak of nature. I honestly don't know where he gets all the negatve energy. He must be enrolled in some kind of hater training program. 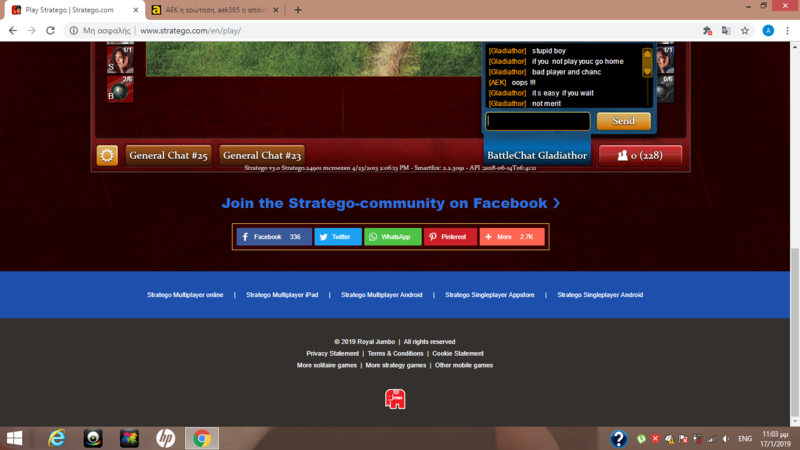 I have a screenshot of the chat. Edited by Lord Invader, 15 January 2019 - 07:28 PM. Pending admin action, player kopros will be banned for two weeks and sent a 3rd degree abusive behavior letter for verbal abuse in a recent game with mojitococo. I was just matched up w/ " 12" again, but this time I was ready. 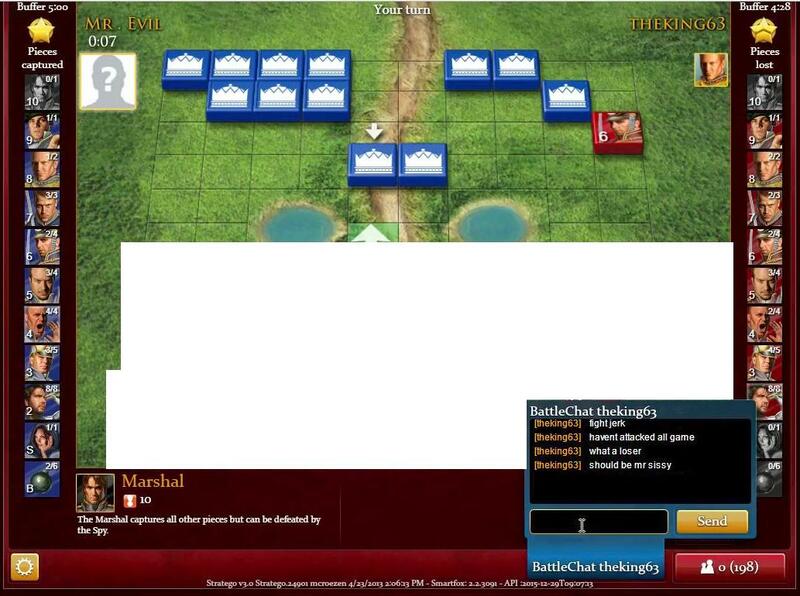 I scouted his General on he first move and he slammed his Marshal into a bomb behind the lake. 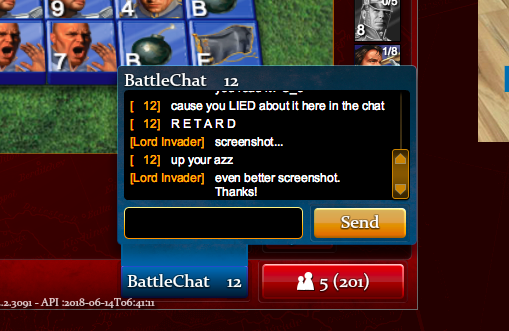 ;-) At that point, he stopped playing, but told me I would have to "wait" for my win; he then ranted away in the chat until the buffer ran down. Thanks, we'll look into this new alias of his. Pending admin action player justbecoolman will be banned for one week and sent a 2nd degree warning letter for comments made in a recent game against AEK. Is Justbecoolman being provoked here by AEK stalling? There is often some consideration given for this factor by probably most of the moderators, though not always all. For this case the language was considered blatant enough by the team for a first, and with a previous recent conviction on the books justbecoolman got his 2nd. I d like to report Dilaver from bad talking. this time we have a french "gentleman"
Edit: the addition of the player's nationality isn't necessary. Just as an objective observer, I would like to ask the MT if they would request AEK to provide them with the complete BattleChat from this particular game. The toggle bar shows that there is much more chat, and as AEK seems to be having more than several players chatting abusive language, I believe this may also provide something of further importance. This is just a mere observation. Edited by KissMyCookie, 18 January 2019 - 04:26 PM. thorino will receive the 1st degree abusive behaviour letter. Dilaver will receive the 1st degree abusive behaviour letter. The MT feels this doesn't warrant a warning. Repeated small offenses from this user may eventually lead to one. Gladiathor will receive a 1st degree warning letter, but only just.